A former San Diego-based company that helped runners sign up for events has settled a consumer protection action with San Diego and other counties. Homepage image from Active Network. District Attorney Bonnie Dumanis announced Wednesday that her office, along with the District Attorneys of Alameda and Sonoma counties, settled with Active Network LLC, which provided online registration services for people and groups wishing to host activities such as road races, camping trips and corporate events. 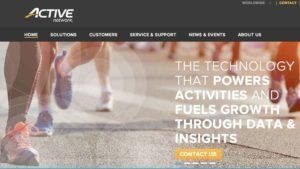 Consumers who registered with Active Network for an event complained they were enrolled in a discount program without their knowledge. The civil complaint filed in Alameda County alleges that Active offers a paid membership program known as “Active Advantage,” which gives members discounts on future event registrations and other goods and services. Between Jan. 1, 2010 and Dec. 31, 2013 — much of the period of time covered by the civil action — membership in Active Advantage cost $59.95 and later $64.95 per year. Membership in Active Advantage is automatically renewed each year, unless a member decides to cancel. The complaint alleges that Active violated California consumer protection laws, including the laws governing “automatic renewal” contracts, by, among other things, advertising a free trial membership in Active Advantage without adequately disclosing that at the end of the trial period, the consumer would be automatically enrolled in a paid subscription program requiring the consumer to affirmatively cancel that membership to avoid annual charges of $59.95 or later, $64.95 per year. Under the terms of the court-approved judgment, Active agreed to fully fund a restitution program sufficient to reimburse about 100,000 California consumers who, between 2010 and 2013, paid for Active Advantage but did not use the service to get any discount or benefit (excluding any discount they may have received automatically upon enrollment) and did not already receive a refund. Active will set aside an initial fund of $1 million for restitution payments and replenish that fund as necessary. The restitution program will be administered by a third-party claims administrator which will issue notices to eligible consumers and set up a website to handle claims that are submitted. Consumers who joined Active Advantage after Dec. 31, 2013, and have not used the service to get a benefit or discount (excluding any discount upon initial enrollment) are also eligible to receive a refund by contacting Active directly. In addition to the restitution program, Active agreed to pay $2.7 million in civil penalties and $150,000 to reimburse the costs of investigation. Consumers interested in learning more about the restitution program should contact the claims administrator, Gilardi & Co., at (855) 730-8661.